We manage all aspects of the Food and Beverage operations in nearly every venue we serve. Allowing us to maintain the highest quality controls while delivering the greatest profits, and all under the VenuWorks name. Our in-house operating model provides the most upside potential for the venue, significantly improving the net departmental profits earned. There are no subsidiaries requiring their own profit lines. Our financial reporting is transparent and our accountability to the client unfettered. The in-house operating model creates the greatest flexibility in negotiating event/convention business terms since no third-party guaranteed percentage influences the financial negotiation. These proven systems provide for ongoing quality control and direct management of menu pricing, inventory management, and financial accountability. Our set-up allows event planners a ‘one-stop shopping experience’, in which one management entity controls scheduling, pricing, and food arrangements. Sound and lighting equipment, staging, dance floors. Staffing including food preparation and service, bars, sound and light operators, housekeeping, security, etc. Catering packages for all-inclusive pricing. VenuWorks has developed a proprietary F&B Planning Guide that systematizes the processes and governs our food and beverage business affairs. This manual has helped standardize and streamline food operations, giving our managers a quicker view of pertinent information; and allowing us to plan and forecast more accurately the needs for any event. VenuWorks takes pride in the continual training aspects required to maintain higher standards of service. We often solicit suggestions from our attentive front line service teams to increase customer satisfaction and exceed expectations. Delivering F&B products and services of the highest quality, including menus, portions, and pricing to create positive and lasting customer relations. Implementing internal controls to safeguard inventories; including receipt, storage, and physical count processes. 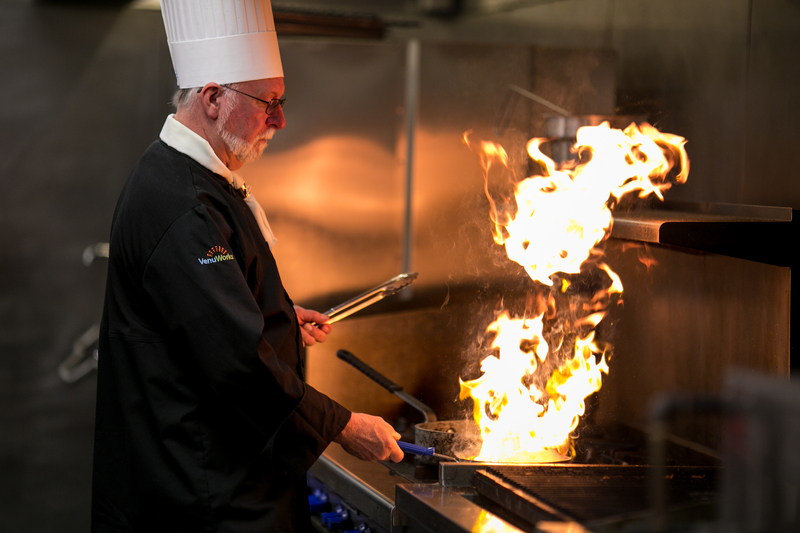 Direct and open communication from our collective kitchens to our Vice President of Food and Beverage Services, ensuring standards are maintained and all operational concerns are addressed. Positive relationships with local, regional and national vendors to meet our client needs and requests with quality product selections. Contact us today for more information about our food and beverage services.